Have you wondered why people aren’t choosing to follow your social media profile(s)? Maybe your Facebook Page isn’t getting “likes” as frequently as you’d hoped, or maybe other Twitter users or Instagrammers aren’t following your business account back? 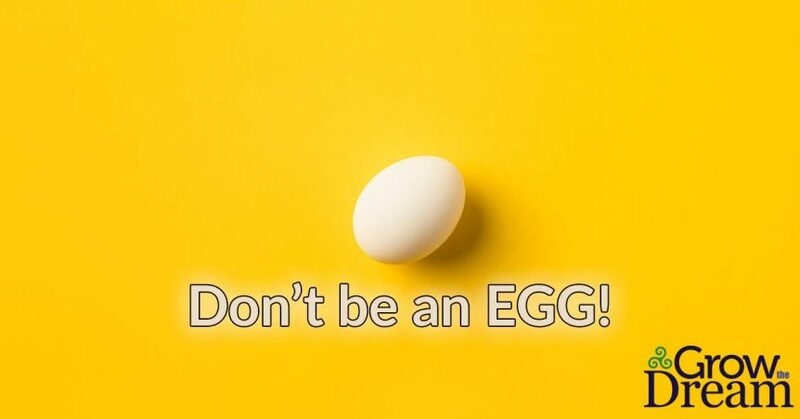 It just might be because you’re an egg. What do you mean, I’m an egg? It was about this time just last year that Twitter put their virtual foot down and announced that the icon they’d used since 2010 to signify a user account with no uploaded pic would be getting scrambled. Well, not literally. But thanks to the enormous amounts of fake Twitter accounts created for the sole purpose of abusing other real users of the platform, the Twitter “egg” is now synonymous with Internet trolls and bullies. But prior to becoming the ‘go-to’ symbol for cyberbullies and the like, the ‘Twitter egg’ was the symbol for someone who just didn’t care – or understand – enough to upload a personal profile pic. Since Twitter launched in 2006, there have been literally millions who have jumped on the platform. They know or have heard that they should be utilizing it so they create a profile. And then promptly forget about it a few days later, leaving behind a generic icon, a few followers, and more congestion on the Twitter-verse. Including a LOT of business accounts. And even when those accounts are reclaimed – hopefully by the actual user and not some spambot – they often still neglect to change their avatar. In today’s world that means no one will follow you. They either assume the above thoughts about cyberbullying, or presume you’re just too lazy to fix the icon, which means you don’t really care. For personal or business, this is bad news, because like it or not, social cache is valuable these days. And no one’s got the time to follow a generic icon, when they’re already dealing with too many ‘real’ accounts in the virtual world that don’t interact with their customers either. But, I hear you saying, there’s SO much social media. There’s no way I can track it all and respond to it all. After all, I don’t have the resources of @SouthwestAir, and I still have a business to run. Well, first, I’m going to mention once again, the importance of doing your strategic business work to target your ideal customer. One of the ways to use all of that data you’ve collected is to figure out which social media channels your customers are most likely to be on. Target those first and always. You can always go back and add Google Plus or WhatsApp, for example, later. Your first priority is to established your presence on the top social media platforms your customers prefer. Just a quick tip – while it seems like everyone is on Facebook, Twitter and Instagram, they’re not. Facebook’s users are typically older, 25 to 34 year olds making up 30% of the users – and 1.74 Billion of them are checking it from their smart phones. They also have the most senior citizens than any other platform. Twitter tends to skew more middle aged and is still considered the more professional site. And Instagram is tops for visually-stimulated millennials (and Gen X & Y). They’re also more female-centric and more global. Now that you’ve established your business (and yourself) on the platforms, there are several ways you can automate your social media. Platforms like Hootsuite, Buffer & Crowdfire allow you to schedule several posts a week or more for free or a small monthly fee. But if you really want to take control, Infusionsoft has several options to integrate with Twitter and Facebook, including adding new Like and Follow-ers (and Survey Responders) to their own contact lists and tagging your contacts in appropriate relevant posts. Every platform has a place for a bio – whether it’s 160 hashtaggable characters on Twitter, or as-long-as-you’d-like-it “About” section on Facebook – make sure you fill it out. Remember your strategic work, and give as much detail with relevant keywords and phrases as you can. You can also link to other social media profiles and answer the questions you know your ideal customers are asking. Business name, phone number, address, website and again, other social media profile links. And make sure all of the links work. Pick a handle that represents your business as best you can, and use it across EVERY platform. If you can’t match it exactly, try to get as close as you can. I’ve worked with some businesses that actually choose their company name AFTER they get their social media handle. The same goes for your images – along with the name, the photo is your brand on social media. Recognition is key here. So choose something that works – a logo or a piece of one, a face or something that uniquely represents your brand or company. Keep it simple and straightforward – and use it EVERYwhere. The more people see your brand identifier as they scan their various social networks, the more likely you are to be in the top of their minds when they need your product or service. Especially on Facebook, connections are extremely important. So take advantage of that by LIKE-ing other business and influencer pages that are relevant to yours. While it’s primarily meant for individual users, when you make your interests or the Pages you like a public part of any profile, you’re giving Facebook an indicator about the kinds of people you’d like to be united with. Back in the day, if you wanted to properly fit out your social media profile, you had consistent profile images, header images and even sidebars. And they all needed to be set to the proper dimensions. Nowadays, those are still good to have, but with most people interacting on cell phones and reading newsfeeds and infostreams rather than visiting individual profiles, it’s less critical. For a really deep dive into social media image size and optimization, read this. Social Media is probably one of the largest, most misunderstood and least fully utilized breakthroughs for marketing efforts in the last 50 years. You owe it to your business to do as much as you can with it. And if you’re one of those poor folks who still has one of the generic social media placeholders to represent your brand? Well, I hope this post ‘eggs’ you on to fix that, today!